Lake Tahoe, Truckee and Reno are three places that a Bay Area resident visits during Winter. Truckee because you can stay in a beautiful cottage. Reno because you can gamble all the way you want and Lake Tahoe because one can ski there. Because there is no snow during Winter anywhere else in Northern California. Lake Tahoe is one of the most clearest and deepest lakes in the world. In fact at some places one can see clearly as deep as 70 feet. This photograph was captured during one of my trips to Reno with my uncle. We did not anticipate stormy weather. But the clouds were moving so low we could barely drive. So we pulled over at a picnic area for the storm to subside. 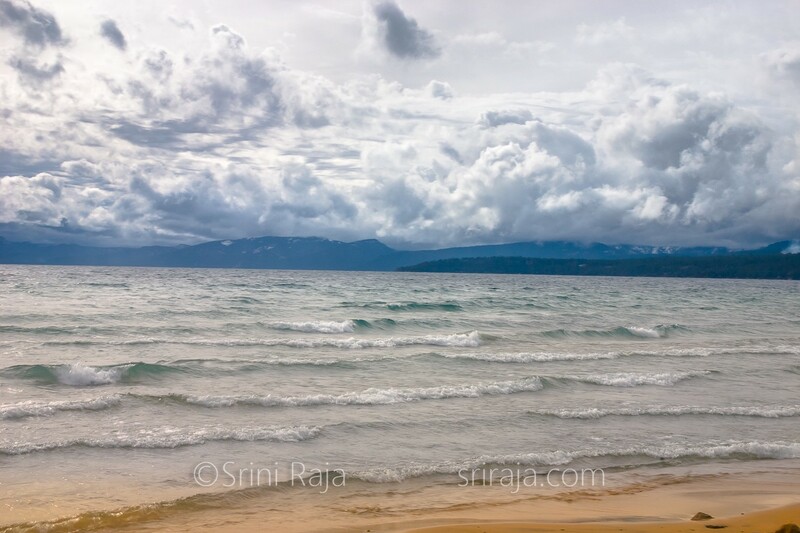 We could see the beautiful waves over the Lake and the clouds dancing violently to the wind. After watching this over a few minutes, we pulled our Cameras out and started taking photos. It was raining, insanely windy and freezing but as always it is my favorite time for capturing photographs. Lake Tahoe is indeed Bay Area’s favorite Winter destination but most outside Bay Area barely visit the place. After our hands became almost frozen, we drove to Truckee, found a wonderful small Cafe to defreeze our hands in front of a fireplace with a Latte. Isn’t that what Winter is all about? ?